The IHRC has assessed the human rights implications for the State of what occurred in the Magdalene Laundries. 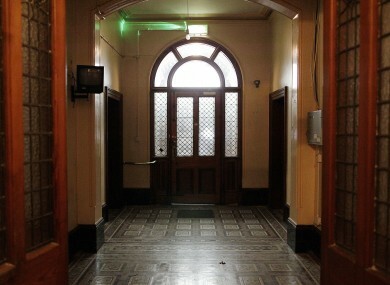 The front door and hallway of the now derelict Sisters of Our Lady of Charity Magdalene Laundry on Sean McDermott Street. THIS MORNING, THE Irish Human Rights Commission said lessons must be learned from the breaches of human rights experienced by girls and women living in Magdalene Laundries during the 20th century. “The State must never be complacent in the way it treats those at risk of discrimination,” Sinead Lucey, Senior Enquiry and Legal Officer of the IHRC said at the launch of the body’s Follow-up Report on State Involvement with Magdalene Laundries. The publication outlines in what ways the State failed in its obligations to protect the human rights of its female civilians. It calls for a comprehensive redress scheme to provide survivors with restitution for lost wages, pensions and social welfare benefits; rehabilitation supports including education, health and welfare; monetary compensation; and assistance to deal with the psychological effects of being in the laundries. The review examines the facts laid out in Martin McAleese’s February 2013 report, assessing the human rights implications for what occurred in the infamous institutions. The IHRC concluded that the girls and women taken into the laundries “did not have their human rights fully respected in relation to equality, liberty, respect for private life, education, and to be free from forced or compulsory labour or servitude”. It also found that State involvement had been confirmed by McAleese but added that his report did not draw any conclusions on the State’s obligations. “To fill that gap, the IHRC has reviewed the findings of the IDC report against a range of human rights standards. We conclude from the evidence available that the human rights of girls and women placed in the laundries have not been fully respected,” said Commissioner Siobhán Mullally. The State acted wrongfully in failing to protect these women by not putting in place adequate mechanisms to prevent such violations, and by failing to respond to their allegations over a protracted period. Credible allegations of abuse should always be promptly, thoroughly and independently investigated. On the issue of forced labour, Lucey said the State failed to follow its obligations under the 1930 Forced Labour Convention. “This is compounded by the fact that not only did successive Irish governments not outlaw and suppress such practices, as they were required to do, but the State itself availed and benefited from such forced or compulsory labour when it entered into commercial contracts with the Laundries on the basis of being the cheapest, but the crucial factor here was the workers were unpaid,” she concluded. The Commissioner also used the report launch to call for an end to the State’s practice of caring for people with intellectual disabilities in psychiatric institutions. The Justice Department is currently reviewing Justice John Quirke’s recommendations in relation to a redress scheme for surviving victims. Email “Human Rights Commission: The State failed Magdalene women”. Feedback on “Human Rights Commission: The State failed Magdalene women”.